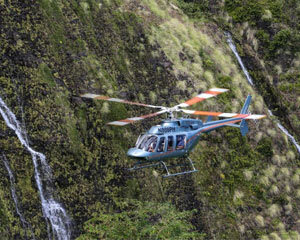 This Hawaiian scenic helicopter flight includes overhead views of live volcanos, a tour of historic Hilo, a trip to the botanical gardens and a zipline adventure. This Hawaiian famjam has it all—a scenic helicopter flight that includes overhead views of live volcanoes, a tour of historic Hilo, a trip to the botanical gardens and a zipline adventure that puts you and your loved ones smack in the middle of a real American paradise! Fly over Hualalai and Mauna Loa. Head to Hawai’i Volcanoes National Park where liquid fire runs from the world’s most active volcano, Kilauea. Fly over the Pu’u Vent. After snapping a million overhead photos, you’ll land at the Hilo base and receive shuttle transportation to Downtown Hilo. Spend hours exploring the historic district. Shop, eat, mingle with the locals! Here, surrounded by some of the island’s greenest, lushest scenery, you’ll embark on one the world’s most scenic zipline adventures. See over 5,000 species of plants and get exclusive waterfall views, all from the treetops on a seven-line course! Not to mention, you’ll receive shuttle service from and to your hotel. Consider all you’ll see and do in a single day with such little planning. A jam-packed excursion like this one lets you kick back for the rest of your trip and not have to worry about missing a thing!